Q#1: What projects do you think should be undertaken for the future? 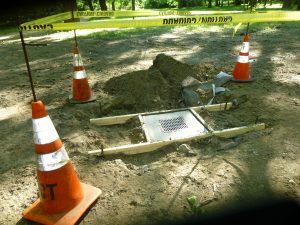 Our response: We will continue to work with the Township on trail issues. With respect to the large less comfortable stones on the path at the far side of the park, the Township has found that trying to finish off paths using the fine gravel works on level paths but does not work on slopes, where gullies develop. We don’t have an alternative at this time. However, we have found that shoes with thicker soles help. Our response: One of our top priorities is to continue ongoing planting efforts to reduce mud, replace tree cover, and enhance the wildlife habitat. We will soon be doing planting under the Dog Park sign as well as in the wildlife garden, riparian areas, and the boggy areas. Our response: Regarding park fencing, the path that leads up to Mill Creek Road is a Bridlewild Trail and cannot be blocked off. As to the rock/dirt pile near the entrance, we have been discussing this with the Township for some years and there is some concern that excavating the pile will destabilize the wall. We are thinking of trying to plant a thick hedge around this area that would discourage dogs from running up there. We take dog safety seriously and in the past we added the entrance gate and extended existing park fencing for this reason. But unfortunately WMC Park cannot be completely fenced. We are planning to post signage that provides a warning to help ensure that all park users understand this. 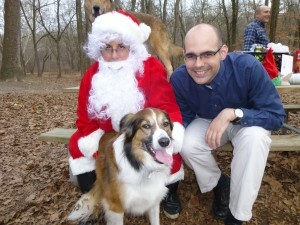 For those who cannot rely on their dog’s recall skills, there is a completely fenced dog park area at Rolling Hill Park. ** Regarding the intersection of Old Gulph and Mill Creek Roads, we contacted our Commissioner, Dan Bernheim. Dan contacted Officer Michael Sullivan, who deals with traffic issues at the L.M. Police Department, on our behalf. Officer Sullivan has told us that traffic signs and signals are subject to both Federal and State regulation. Under those regulations, neither traffic volume at the intersection nor incidence of relatable crashes qualify the intersection for an added stop sign or other traffic control device. He also told us that studies have shown that stop signs put up where people don’t expect them can actually cause more accidents than they prevent. So — added traffic signals at Old Gulph and Mill Creek is not an option for us at this point. Be cautious at the intersection! **Regarding parking lot break-ins, we will run this idea by the township, but regretfully we think the most effective option is not to leave valuables in your car when visiting the park. Our response: Unfortunately, running water in the park is impracticable at this time. Hygiene: “Some persuasive educational approach to encourage dog owners to pick up their dogs’ poop–even when it’s off the path (since it goes into the watershed). Our response: We have created a brochure on this subject that is available at the kiosk and on our website, and we issue reminders at our annual meeting and in our annual newsletter. We are very concerned about this and would welcome suggestions that would further address this issue! 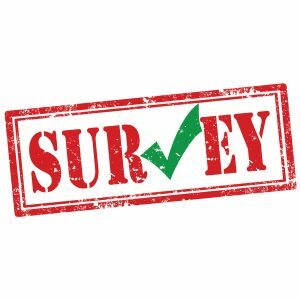 Q#2: Any other comments or thoughts you would like us to consider? 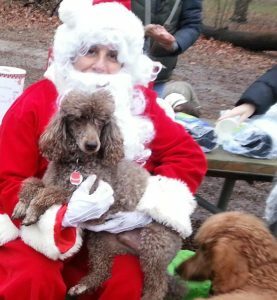 Our response: Thanks for the positive feedback – and we agree it’s all the dogs and all the people together as a community that makes our park so special. This entry was posted in What's New on May 27, 2018 by Ellen Briggs. Tree Safety. A number of our members have expressed concern about the erosion under the large tree across the stream at the beach area. We asked the Township to take a look, and the Township Arborist and Parks Supervisor evaluated the tree. The Arborist says the tree has enough healthy root system so that it does not present an immediate danger. The township will continue to monitor the situation and will deal with the tree if it becomes hazardous. New Kiosk. The Township kindly offered us a new kiosk paid for from special Township funds dedicated to park improvements. 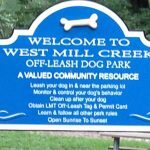 In addition to Township postings relevant to our Park, we will be permitted to use part of the space for Friends of West Mill Creek postings. 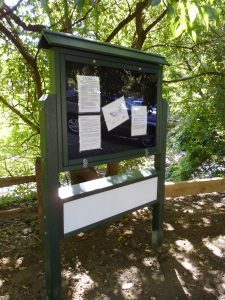 The new kiosk also has space for brochures, off-leash permit application forms, and other useful information. Thanks as always to Lower Merion Department of Parks & Recreation!!! This entry was posted in What's New on October 16, 2016 by Ellen Briggs. Lots of news this summer. . .
afety fence that will run along Old Gulph Road and along the bank of the creek opposite the beach area. This black wire fence should be almost invisible to preserve the natural aesthetics of our park. It is intended to stop dogs who cross the creek in the beach area from running directly out onto Old Gulph Road. (Sorry, we cannot fence the entire park, but we believe the placement of the new fence will provide a significant safety improvement.) Thanks to your generous donations, Friends of West Mill Creek Park will pay for the 100% of the fence. Another big thank you is due to our neighbor, The Courts, the tennis club that owns the property on the other side of the creek. The Courts graciously cooperated in this project by allowing the fence to be placed on their property. New Sign. If you’ve been to the park recently, you will have noticed our spiffy new “Welcome to West Mill Creek” sign. It has received lots of positive feedback. 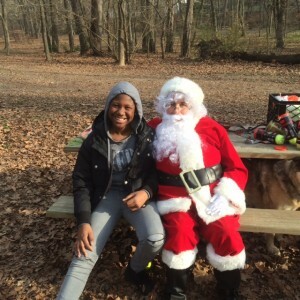 Thanks Lower Merion Department of Parks & Rec! You may be interested to know that the sign results from a job skills training program in our Montgomery County prison system. The prisoners designed and manufactured the sign and we think it shows that they have a lot of artistic talent and know-how. Great job guys! New Trash Can Corrals. 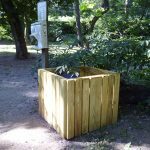 Many thanks, once again, to the Boy Scouts for our handsome new trash can corrals. The corrals will keep the cans from tipping over and also provide an aesthetic upgrade. They come to us courtesy of Paul Lewis of Boy Scout Troop 71 (Merion Liberty Troop). Paul worked with Parks Supervisor Dave Deangelis to design, build and install the corrals as his Eagle Scout project. Thanks Paul and Dave! We Love Your Input. 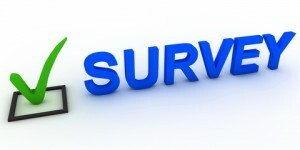 If you have an idea for a future project or event, please let us know. You can either speak to someone on the Steering Committee or send us an email via the Contact Us tab on the website. Our projects have frequently originated from member suggestions, or received a boost up the priority list based on your feedback, so please participate! Want to Support the Friends of WMC? We hope that you are pleased with all our progress this year. If you would like to support the new safety fence and future projects, it’s not too late to make a donation and become an official 2016 Contributing Member of Friends of West Mill Creek Park. See the “Get Involved!” tab on this website for information. This entry was posted in Uncategorized, What's New on August 15, 2016 by Ellen Briggs. We have lots of news, big and small, since our last newsletter. TRAIL IMPROVEMENTS! The most exciting news is, improvements to the final muddy section of our trail are under way. Soon we will have dry footing on the entire loop trail. 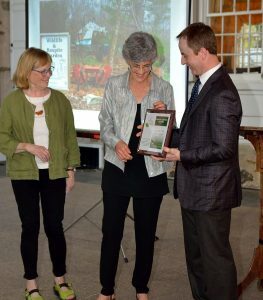 Many, many thanks to Lower Merion’s Dept of Parks & Recreation for addressing the Number One project on our members’ wish list. Our Little Herb Garden — Help yourself to some leaves on your way home! FREE FRESH HERBS. 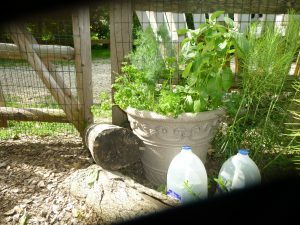 If, as you head home from the park to fix dinner, you’d like a bit of basil, parsley, dill, or oregano, help yourself from the herb pot in the Wildlife Garden, just inside the garden gate. Just remember to leave enough on the plant so it can keep on growing through the summer. And there are gallon jugs of water next to it, so if the pot is looking dry, feel free to water it. 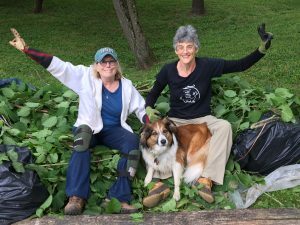 KNOTWEED WORK DAY REPORT. During 3 work days in early June (two scheduled and one ad hoc to finish up), 11 Friends of WMC members spent 58 hours pulling out Japanese Knotweed, an invasive plant that increases stream erosion and crowds out wildlife friendly plants. A big thank you to Julian and Paul Brenman, Ellen and Stephen Briggs, Paula Burns, Michelle Detwiler, Mary Field, Karen Hinckley, Hazel Murphy, Ellen Reese, and Elaine Stern. We cleared the fenced off riparian area from the park gate all the way down to the second stream access point. There’s more to do in the final fenced section from the second stream access trail to the end of the park (and elsewhere). Email us (use the Contact Us tab on this website) for instructions if you would like to continue this work. WEEDING WEDNESDAYS. We scheduled three garden workdays to weed and cut back overgrown sedge. We got lots of work done at the first one but there are two more, on June 22 and June 29, if you’d like to help. We are sending notices about this only to those who have expressed interest in working as a garden volunteer. If you would like to be included on that list, just shoot us an email. Also, garden workdays are always listed on the website so you can check for details there if you’d like to join in. This entry was posted in What's New on June 16, 2016 by Ellen Briggs. Villanova, beginning at 6 p.m. If you haven’t seen Appleford, it’s a lovely historic house and garden, well worth a visit in its own right. Anyone who would like to attend is welcome to come and cheer us on. And that brings to mind that gardening season is here! If you are interested in being on the Wildlife Garden watering team or garden team, please send an email to briggs505@verizon.net and specify watering, gardening, or both. This will not commit you to anything—it will just put you on the list of people who will receive email regarding appeals for watering, weeding or planting help in the garden. This way, we will not be bothering people who don’t want to participate in ongoing maintenance with garden-related email. 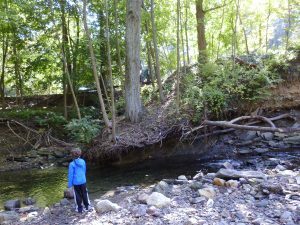 Note: When the need arises for a big work day, such as an invasive plant removal project on the stream bank, we will notify the entire membership. This entry was posted in Uncategorized, What's New on April 22, 2016 by Ellen Briggs. Q#1: Should a gate be installed on the entrance path between the parking lot and the main park? Q#2: Would you be willing to donate to finance construction of the gate described in Q#1? 77% of respondents (27 people) said Yes. Q#3: Should fencing be installed on the far side of the creek near East Old Gulph Road to deter dogs from running onto the road? Q#4: Would you be willing to donate to finance construction of the fence described in Q#3? 53% of respondents (18 people) said Yes. Q#5 : Are there any other important projects you would like Friends of WMC to pursue? The recent drainage project is working well. Other areas of the path still flood, so these areas need a fix too. Kudos to Ellen x 2, Jill and all else. There are some brick blocks next to the parking lot trash can that need to be hauled off. Drainage continues to be an issue. The large puddle by the creek that is as big as a lake needs to be filled in. Build up the walkway on the lower side of the part where it floods all the time. Fill in black mud pond by wooden walk by old Gulph. Dogs wade in it and become black-filthy. Let’s get rid of the pond. Q#6 Do you have any other comments, thoughts, suggestions? This is very important; thank you! Glad we have you caring and taking action on our park! Many thanks! Safety at the intersection next to the park entrance. Like the idea that dogs be leashed when in the parking lot. Peer pressure works wonders. A gate is a costly partial solution, but if funds can be raised or the township agrees, go for it. Wonderful work so far!!! Thanks to everybody! I keep tripping over poop. People with loose large dogs need to keep their eyes on them at all times and go to the poop and pick it up. I’m glad you mentioned the importance of keeping all dogs on leash in the parking lot . So many near misses observed. I think other areas in the park are also concern re: dogs’ safety. This entry was posted in What's New on February 23, 2016 by Ellen Briggs. On Saturday, December 12, Santa Paws once again visited our park. He posed for pictures with our dogs and gave a biscuit and a tennis ball to each good pup. 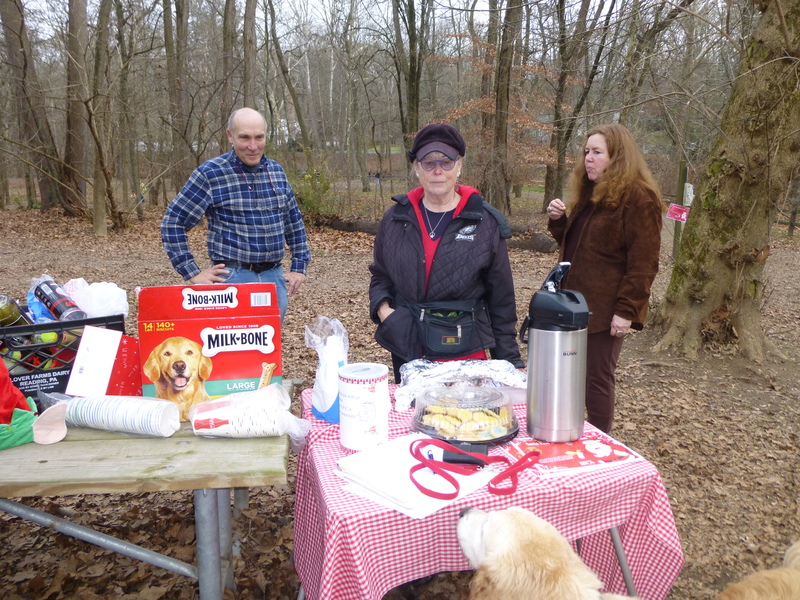 Hot cocoa, cookies, and doughnuts were available for the humans, and a good time was had by all. Most important of all, the event raised well over $500 for the Pennsylvania S.P.C.A. 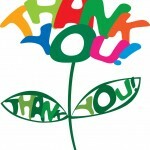 Thanks to all who participated for your enthusiasm and generosity! P.S. 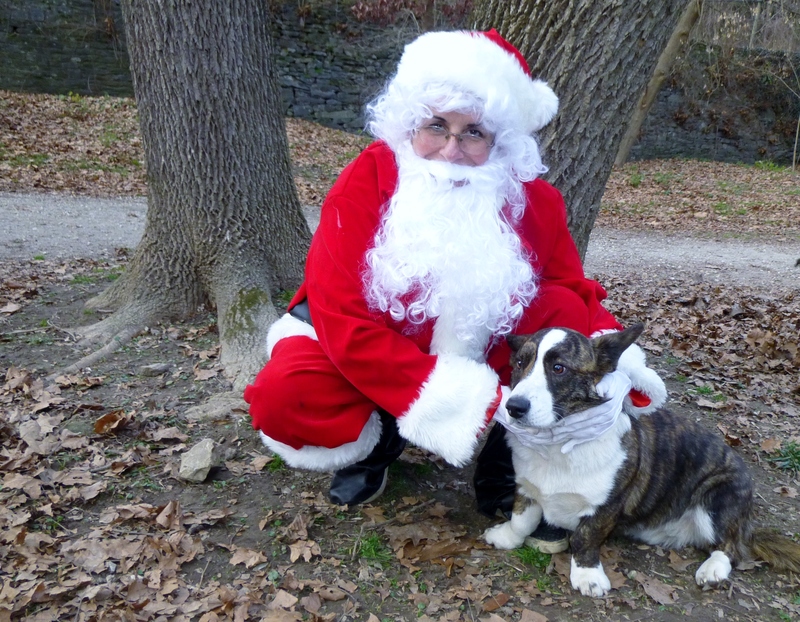 you will be glad to know that Santa Paws got a well-earned vacation and is now believed to be cruising the Caribbean. 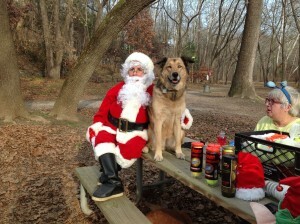 THANKS SANTA PAWS for appearing at WMC Park! This entry was posted in Uncategorized, What's New on December 14, 2015 by Ellen Briggs.